The umpire called time and the crowd rose. They clapped. Almost every single one of them. The applause was jarring on a morning of closed-faced bunts and turgid run accumulation. Gary Ballance was out there, but no one was applauding him. It was all for Alastair Cook. He had survived until lunch. 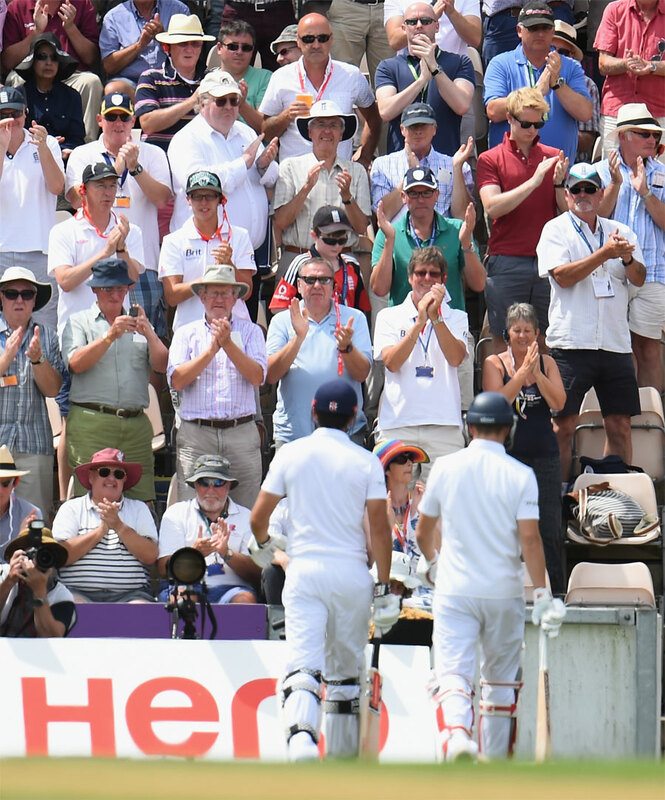 One whole session and the crowd rose to congratulate a man with 25 Test centuries and over 8000 Test runs because he didn't get out. It was un-ironic and spontaneous, they clapped not because Cook hadn't been good, but more specifically because he wasn't bad. The crowd gave a collective "ugh" noise as the very first ball took his edge and went towards slip. This pitch and Bhuvneshwar Kumar's pace meant that it travelled slowly but the potential car-crash nature of a Cook first-ball duck slowed it down to a an excruciating degree. Cook's career was wobbling behind him. Most of the crowd were still yet to put their bags on the ground. Billy the Trumpet had not even finished wetting his lips. And had the ball carried all the way to second slip, Cook would have been gone. Gone. The crowd didn't applaud the edge falling short, but they all started breathing again as it did. It didn't get better. A ball hit the face of Cook's bat and it turned his bat around. He played an off-side shot with the bat on an angle that would turn the stomach of many batsmen. His thigh pad was hit. Cook protects his thigh pad like it proves the existence of God when he is in form. This was not Cook in form. This was a wet-blanketed edgy bloke who missed balls on his pads. Pankaj Singh came around the wicket to deliver a ball angling in, short of a length, and moving away. Cook edged it. Ravindra Jadeja dropped it. Cook was working on everything. His guard had moved back to leg, from the middle at Lord's. His feet were more open. And he was holding his bat in such a way he was physically forcing himself to play straight. Had he superglued his hands on to the bat, he could not have emphasised that he was trying to overcome his flaw. Even his backing up at the non-striker's end was forced. Instead of a gentle walk in with bowler, or even an eager jog, he had adopted a near jump-and-pounce premeditated manoeuvre that left him in a cat-like pose waiting for the single. This was a man who had thought more about his game in the last week than people talk about tragedies on Twitter. A normal defensive shot ended up looking like the bat and ball are determined to not meet. A juicy half volley was punished with a feather. Even his pull shots weren't Cook pull shots, they were polite cross-bat paddles followed by a jog to the other end, happy enough to get off strike for another ball. Finally there was a ball slow and terrible enough for Cook to bring out the true force of his family and smack it. It was short and disgusting, but as it flew through point the crowd cheered as if Cook had beheaded a wyvern. Sure, most of the crowd could have hit it for four, but Cook did it, their Cooky, they want him to succeed. The celebration didn't last long, his back foot inventing a new dance move as he played and missed. "The Cooky" may never catch on. A slash through gully put hands on heads of Indians and provided sharp intakes of breaths all around the bowl. A really, really, really slow short one from Rohit Sharma virtually hit itself for four and then applauded the shot as Cook watched on. India dropped Cook, but they also helped by bowling as inconsistently as they could to him. They tried to bowl short, because they clearly didn't see the viral video of how often he is dismissed from full balls. They were too wide. They were too straight. The impeccable groupings from Lord's were replaced by single dots that seem to be following no real plan. Cook wasn't forced to play straight, so he didn't. His traditional V of just behind and just in front of square leg reemerged. He didn't charge down to reverse sweep a bouncer. He started hitting the balls on his hip, he hustled between the wickets , he bunted balls out to point and stole singles, he cashed in on short balls outside off stump, and he ignored the zone straight down the ground. If batting could be compared to the good looks of Hollywood's leading men, this was the Tor Johnson. It bumped into scenery, mumbled incomprehensibly and made you feel awkward for much of the time you were watching it. But it was an innings. An actual innings. One that they didn't even seem to mind finishing five runs too soon. The final ball. The seven-two leg field. The short filthy delivery down the leg side. The batsman trying to hit the ball a bit too hard. An umpire readjusting his trousers. Alastair Cook dismissed for 95. The crowd stood and applauded. They stood and applauded him for getting to lunch. They stood and applauded him for getting to fifty. They stood and applauded him for getting to 95. They stood and applauded as he left the pitch, walked up the stairs, and then up the other stairs, and then as he finally disappeared into the dressing room. They stood and applauded him for simply not failing. They like him.